A fine instrument, just watch out for that price tag. Youthful enthusiasm and dazzling tonal presence combine with sublime build. The price pits it against higher-cachet competitors. Yamaha has been turning out quality acoustics for many, many years, but still the company’s expertise in the area goes largely unsung. Owners will attest to the calibre of workmanship, the sound and excellent playability to be found in its instruments, not to mention innovative pickup design and, more recently, its ARE heat treatment for soundboards. So, what exactly is the deal here? We took a new model from the range in order to discover the current state of play - and were drawn in by the charms of Yamaha’s high-end work. The LS26 is from Yamaha’s small-bodied series - if we were to use Martin body sizes as our yardstick, it’s around the OM area with a slightly deeper body. The fact that this model is hand-built in Japan explains immediately why it isn’t anyway near cheap. But Yamaha takes pride in its hand-built range and rightly so, because the look of this simply reeks of class and quality from the outset. The top wood here is an Engelmann spruce that benefits from Yamaha’s own in-house ARE heat treatment, with solid rosewood back and sides. The spec doesn’t say whether this is Indian rosewood or not, although you’d be hard pressed to tell the difference. The neck is Yamaha’s well-known five-ply sandwich of mahogany and rosewood for added strength and general durability. It looks very classy, too. Gold-coloured open back tuners add a little vintage chic into the picture and the ebony ’board completes the overall aesthetic nicely. As we mentioned, this is Yamaha’s small-bodied range, which the company describes as “Concert”, but our tape measure confirms that it checks in around the OM/OOO area with a very slightly increased depth. The rosewood back and sides here - again from an unrevealed source - are more towards the milk chocolate colour. 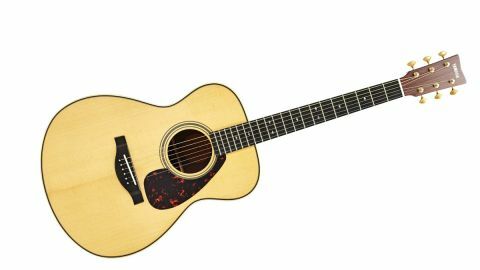 Replacing the somewhat reserved sound picture of the recently-reviewed LLX is a puppy-like enthusiasm that gives all its got from the first strum. The instrument simply bursts to life on our laps. Despite the reduction in body size (in comparison to the LLX), we’d swear that the LS was louder than its bigger brother, too, with a pleasant youthful vigour that you just know will mellow with age as the years roll by and maturity takes hold. If fingerstyle is your thing exclusively, then the LS might just be your new best friend as it sits up and begs for some deft finger work, rewarding the player with sweet, well-balanced and vibrant tones in the process. Build quality on this instrument is beyond excellent, the only dark cloud on the horizon is the price. It is in the range where custom builds are beginning to become a valid option and the mainstream high-end market is replete with guitars that fall into the £3k to £4k range, too. So hard choices and much research would have to be made accordingly, because the price tags here represent an investment that only professional and dedicated semi-pro players might make. Still, as we’ve said, Yamaha has an outstanding reputation for quality that has existed for many decades and, as such, you would do well to include this instrument on any shortlist you might be making before taking the plunge.